Dining on the Princess ships is not just about the main dining rooms. Princess offers an array of specialty venues and alternative dining experiences. On the various princess ships, there are the Crown Grill (see review), the Bayou Cafe (see review), Gelato (see review), the Crab Shack (see review), Fondues, the Ocean Terrace, the International Cafe to name just some. 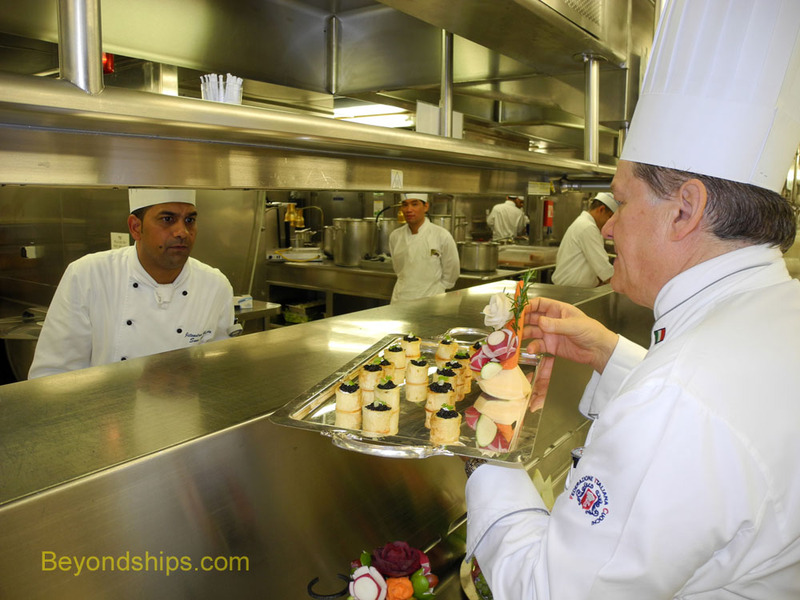 One of the best known specialty dining experiences on the Princess ships is the Chef's Table, which originated with Princess and now has been copied by several other cruise lines. (See slideshow) Once or twice during a cruise, a small group of eight to 12 guests assembles and is taken into the ship's main galley during the dinner hours. The guests see the whirlwind of activity that is taking place as cooks prepare meals and waiters place orders. 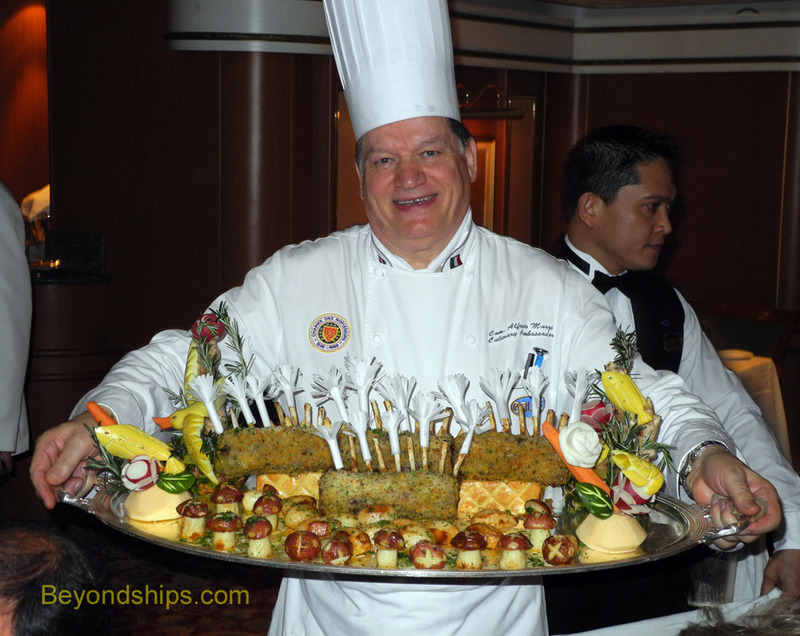 In addition, the guests are taken to a section of the galley where they are treated to a procession of appetizers prepared especially by the ship's executive chef. These are accompanied by French champagne usually poured by the ship's maitre d'. Then it is out into the main dining room, where the guests have a multi-course feast with wine pairings. Many of the dishes are finished tableside by the ship's executive chef. On most Princess ships, guests participating in the Chef's Table experience are seated at an ordinary table in the main dining room. But on Royal Princess and Regal Princess, there are purpose-built structures at the heart of one of the dining rooms. Guests sit at a table separated from the rest of the dining room behind a glass curtain that is bathed in light. It is called the Chef's Table Lumiere. 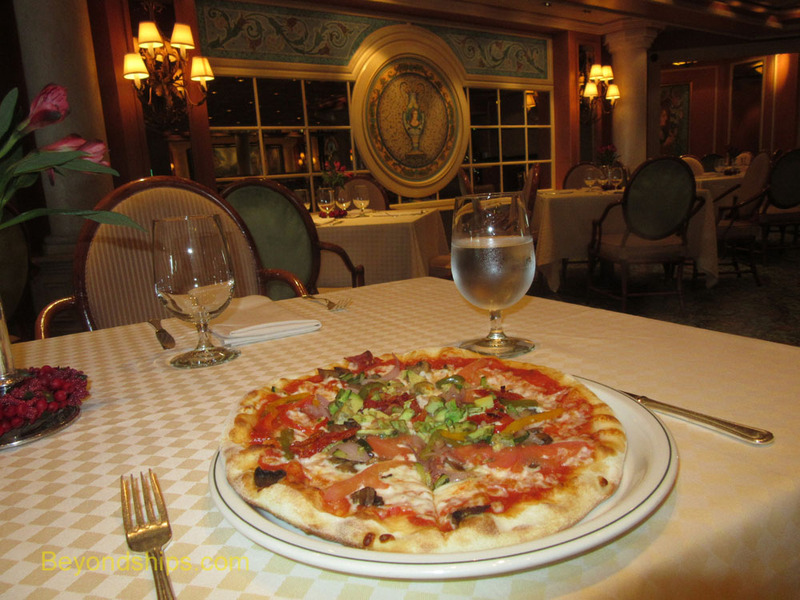 Originally developed for Grand Princess, a signature specialty restaurant throughout the Princess fleet is Sabantini's. Calling these dishes pizza is somewhat misleading. These our individual size gourmet pizzas, prepared ala minute. (See review). The variations were developed by Chef Marzi and recall his Italian heritage.